Things are relatively quiet around the Ruth’s Toffee Store, now that the hustle and bustle of the holiday season has quieted down. We kept busy and I had a great crew of elves to help send out a lot of toffee. Some of my helpers have worked for me for several years and they are great to have around. They help me keep track of things and keep me on track with what all that needs to be done. One thing that we always struggle with this time of year is re-sending out boxes of toffee which have been returned to us as undeliverable. Most often, these have been returned because the gift giver didn’t have an updated address for the recipient. If you sent some candy which didn’t get delivered, or expected some that you haven’t seen, please give me a call. I’ve contacted most of the people who sent toffee that was sent back to me but I want to make sure everyone got what they should have. I spend four months out of the year selling and sampling toffee at farmers markets in the Colorado mountains. During the winter, when I’m not selling there, I spend quite a bit of time thinking about the people I’ve met and planning for the upcoming year. One of the people I thought of the other day was a gentleman who came by one weekend and sampled my toffee. He REALLY liked it. He took several samples and visited with me and picked up contact information so he could order, then took several more samples. He finally told me, after eating so many samples that he apparently started feeling guilty, that he had to leave. He had barely walked away when he came back and told me, “I just wanted to let you know that I am one of triplets. We all look the same and are all dressed the same today, so if someone comes by who looks like me and eats more samples, it is one of my identical brothers!” Yeah, right! However, he definitely gets the prize for fastest thinking on his feet for why he should get more samples of toffee. 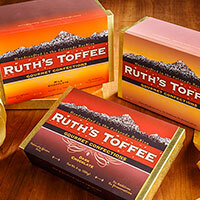 It seems to me that this downhill side of January is the perfect time to order some Ruth’s Toffee. If you got some for Christmas but it wasn’t enough, I can help you out! If you didn’t get any but should have, I can help out there too! Give me a call or go online to order and we’ll help perk up your dead-of-winter days. I will be glad to send whatever amount you want, but remember that we still have our free shipping deal on. All orders of $75 or more to the same address ship free. This offer won’t last forever, so get it now while you can.